The vast majority of police officers are fortunate enough to go their entire careers without having to fire their sidearms outside of training or firearms qualifications. In fact, many officers may never even have to "break leather"—a slang term to describe drawing your weapon from the holster. 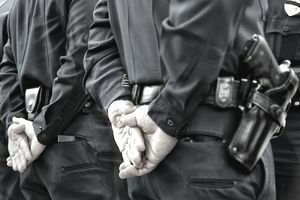 While no comprehensive data currently exists to track the number of police-involved shootings year to year, research suggests that only one in four law enforcement officers in the U.S. have fired their weapon in the line of duty. When the unfortunate situation arises that calls for a police officer to feel he has to use deadly force, questions are often asked after the fact as to why police didn't shoot the subject in the leg or other limbs, or why they had to kill them instead of just injure them. These are understandable questions, but they fail to take into account the totality of the circumstances that require a deadly force response in the first place. It's no secret that law enforcement careers are inherently dangerous. Officers know this better than anyone. Even though police are trained and hard-wired to run towards danger while most everyone else is running away, there's still a tremendous element of fear and stress that they experience during potentially violent encounters. No matter how good of a shot a police officer may be on the firing range—or even during so-called stress course scenarios—all of that precision can very quickly and easily go out the window in a real-world situation. As nice as it might be to think a police officer has the option to shoot the gun or knife out of a person's hand or to deliver a non-life threatening injury, the flowing adrenaline and the amount of stress they are likely under at the time make it nearly impossible. If you've ever fired a handgun, you probably know how much focus is required to make each shot count. Imagine, then, how difficult it would be to make a spot-on shot on a small target, such as a hand, arm, or leg, on a split second's notice, believing all the while that your life or the life of another innocent person is hanging in the balance. If that sounds overly dramatic, it's because law enforcement shooting situations are, in fact, dramatic and traumatic for everyone involved. When a deadly force situation arises, police are trained to stop the threat. The goal of any justifiable police shooting is to eliminate whatever danger exists, as quickly and safely as possible. To do that, police have to act quickly and efficiently, taking into account the challenges and difficulties that come with having to use a firearm with often little or no warning in high-stress situations. To aim for small targets in these situations simply entails too many risks to be a viable option under most circumstances. The smaller the target, the more likely an errant round will miss its mark and put others in danger. Moreover, the more an officer misses their mark in a deadly force encounter, the more opportunities an assailant has to make their attack count. Rather than train to shoot at small targets, police are trained to aim for the torso—known as center mass. This area offers the largest target and, thus, the best chance of connecting and ending the threat. It's a misrepresentation to say that police are trained to shoot to kill. Instead, they are trained to shoot to stop. The quickest, safest—for the officer and any bystanders—and most effective way to do that is to aim for center mass. Though this may increase the chance of death for the involved subject, it maximizes the chance of survival for the officer and anyone else in the near vicinity.